Wolfs' Books: Cycling In The Dark - A Technique For Writing Fiction. Over the course of my reading I came in contact with a book called Writing a Novel in Five Days While Traveling: The Tricks and Techniques of Writing Fiction While Away From Home, by Dean Wesley Smith. Now the title is enough to catch your attention, writing a book in FIVE DAYS while travelling that's quite extraordinary and something I’d love to do. Writers of this modern era are scared most of the time. So they must spend months outlining to make sure their novel is dull and won’t have energy. And heaven help them if they waste a precious word along the way. Writers of this modern era are in a hurry to be successful. So they write to market, to what others want them to write. So this writing exercise was for me, to prove to myself that once again I was born too late as a writer. I wanted to prove to myself that I flat don’t belong with all the lazy, whiny writers of this modern time. I figured any pulp writer could write a novel in five days. But could they do it while traveling? In Writing a Novel in Five Days While Traveling, Mr Smith mentioned two things which caught my attention and gave me pause to reconsider what I am doing. Firstly he says that he can write a book in five days or so because he doesn’t write a second draft! He mentions that he was going to do this all in one draft and he is going to write what he calls ‘a clean draft’ first time, no rewrites. No rewrites! How Does He Do This And Get Away With It? He uses a technique called cycling. He was smart enough to not share this technique in Writing a Novel in Five Days While Traveling but said it is all outlined in another book of his called Writing Into The Dark: How To Write A Novel Without An Outline. The fact that he wasn't going to write a second draft but that he was going to do this all in one draft and write a story without an outline, was exciting and terrifying at the same time. It’s sounded like sacrilege for an author to speak like this. Or as astounding as someone saying they’re going to give a speech without notes, how is this possible? I had to buy and read the book Writing Into The Dark to find out. So What Is Cycling? My Simplified Version. The way I understood it was that it’s basically doing mini-rewrites and edits as you write your novel. Start in your creative mode and write 500-1000 words and then go back and re-read what you just wrote. This is where you change gears and move into critical mode, re-read what you just wrote scanning for mistakes, take stuff out, put stuff in, increasing your pace and changing gears again into creative mode as you come closer to the white space. Think of it like riding a bike, as you start to approach a hill, you start to speed up so you can power on up that hill, the white space is the hill. Once you’re back to the white space, you then write another 500-1000 more words in creative mode, when you get to the end repeat the process over and over again until you’re finished. It seems to go against all the other advice given by the experts who say, outline first, then write using your creative side, but don’t edit as you go because this will stifle your creative voice. This is why you need to then do a second and third draft by going back afterwards with an editors hat on and use your critical side to clean up the mess and polish the story. 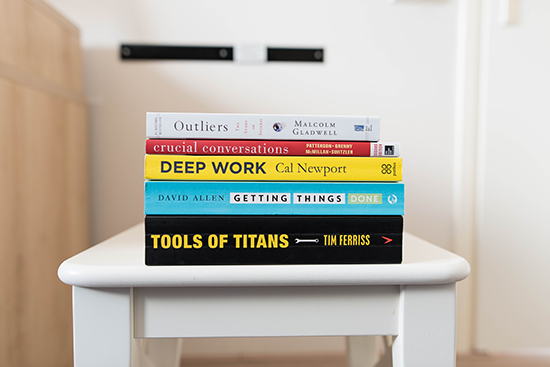 But… when I thought about how I write my blog posts, my non-fiction articles and I realised this is what I'm doing already, so why not try with with fiction. 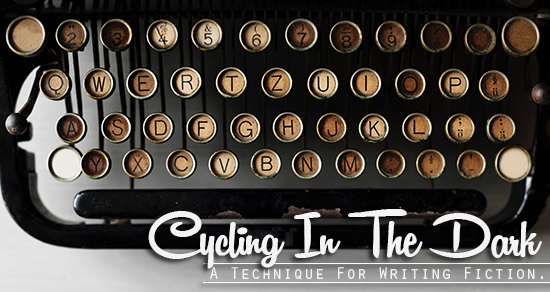 Dean Wesley Smith does a better job at explaining cycling in his book Writing Into The Dark: How To Write A Novel Without An Outline and it is an inexpensive book so I would encourage you to purchase it and have a read for a better understanding of this technique. I don’t want to give away all his secrets and I want you to support him, as I know all us potential authors would like people to purchase our books. In this book he also helps you to overcome the obstacles you’ll encounter both within and without as you try writing your novel with no outline. Like your own critical voice and getting stuck on what to write next. The only purpose of the critical voice in creative writing is to stop you. The fearless writers contain their critical voices and write what they love, what moves them. Writing without critical voice turned on, just writing to tell myself a story, is like reading. The process is wonderful and I enjoy the journey. But right here, early in the book, let me tell you the simple answer. Write the next sentence. And then write the next sentence. I am not kidding. It is at that stuck point that you need to really embrace and enjoy the uncertainty. Getting stuck is part of writing into the dark. It is part of the process, a natural part of the process of a creative voice building a story. So bogging down is part of the process as well. Expect it and don’t be afraid to write extra words or cut words to get back on track. There is no rule that says you must write your book like a reader is going to read it. A key point to remember is that “next sentence” does not have to be the very next sentence the READER is going to read. It just needs to be the next sentence you are going to type. Writing Into The Dark is a really challenging book. Dean Wesley Smith wants to motivate writers to write and not be bogged down or scared by preconceived ideas of how you should write. I know it helped me. After reading all those other books on writing this was the one that really motivated me to continue writing and also provided me with some encouragement to start some new writing projects. Which books on writing have you found beneficial and/or provided you with the motivation you needed to start or continue your novel? I’ve love to hear from you.